If you ever had the chance to read Dav Pilkey’s popular children’s book series based around the misadventures of fictional superhero Captain Underpants, then chances are you’ll know exactly what kind of film you’re in store for: a crude, overly-silly set of scenes designed purely to make its reader – or in this case, its audience – laugh hysterically, and largely succeeding. The adaptation of Pilkey’s most famous creation is produced by DreamWorks Animation, but made through a much smaller animation studio in Canada, as part of DreamWorks’ business restructuring after a series of underperforming movies. This makes Captain Underpants: The First Epic Movie, to use its full title, their lowest-budgeted film at only $38 million (to give a comparison, their last movie The Boss Baby cost roughly $125 million to make), which makes it sound like the film looks and feels as cheap as that small budget suggests, but instead it works in the film’s favour; by not using their traditional animation methods, DreamWorks have been able to replicate Pilkey’s illustrations and style of humour almost perfectly, making it not just a surprisingly faithful adaptation but also making it just as much of a hoot as the original books were. 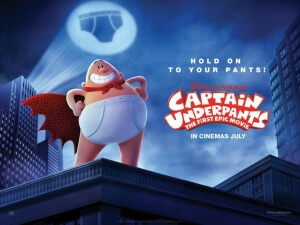 Like the books, the film focuses on two fourth-graders, best friends George and Harold (voiced by Kevin Hart and Thomas Middleditch respectively) who in their spare time cause pranks and mayhem throughout their dull school, and create several comic books featuring the superhero Captain Underpants. However, they frequently incur the wrath of their evil principal Mr. Krupp (Ed Helms), whose mean authority robs the students of any fun whatsoever, and when Krupp finally threatens to separate the two, they decide to do the logical thing and hypnotize him into thinking he is actually Captain Underpants, as you do, which the boys must then keep under control, even when evil science teacher Professor Poopypants (Nick Kroll) comes up with a scheme to rid the world of laughter and joy. Now I know it sounds completely ridiculous, but part of the fun of Captain Underpants is just how much it embraces its own silliness, with the jokes being unafraid to go a bit more surreal route at times (there are sequences featuring sock puppet realities, and even the books’ trademark use of Flip-O-Rama to fill in a major action scene) and fully owning its reliance on potty humour – after all, in a movie called Captain Underpants, you kind of expect the humour to be a bit more, erm, toilet-themed. It’s a glorious mix of batty, unpretentious family fun that has the superpower of making children of all ages legitimately laugh out loud; children at the numerous instances of potty humour, parents for the complete absurdity of the plot, humour et al. The impressive cast is also having a blast with making this material come to life; Hart and Middleditch’s deeper voices might not seem to fit their much younger characters, but you hardly notice that after a while because they work so well together and play fun, relatable characters that use their strong sense of humour to get their way out of the worst situations. Likewise, Helms and Kroll, and even Jordan Peele as humourless nerd Melvin, are having the time of their lives in roles that require them to go over the top in their voice deliveries without sacrificing any of their dignity. The film was written by Nicholas Stoller, who also wrote and directed another hilarious animated film, last year’s Storks, and that same kind of manic, hyperactive sense of humour is all throughout Captain Underpants, to a point where it threatens to leave you completely exhausted by the end of it. Regardless, Stoller and director David Soren (who also did DreamWorks’ Turbo, which this movie is a huge step up from that tripe) bring its bouncy and cheerful humour right into the spotlight, which is good because this movie’s rat-a-tat approach to jokes is one of its many highlights; every single moment of comedy you’re left feeling astonished by how much thought and effort went into bringing to life even the smallest of background throwaway gags that are only on-screen for seconds, which has always been one of Stoller’s greatest strengths as a comedy writer. He and Soren have made an adaptation which Pilkey himself would surely approve, and to my mind it’s the closest adaptation in terms of style and humour since The Peanuts Movie, which also took Charles M. Schultz’ exact character designs and turned them into living, breathing CGI creations. If this summer you are keen to take your kids along to a film that isn’t so concerned with hammering in life lessons or basic morals that even toddlers would be familiar with, and is instead more occupied with making you laugh just like you’re a little kid again, then I would absolutely recommend Captain Underpants: The First Epic Movie as a hilarious and off-kilter alternative to whatever else may be playing in cinemas when it comes out. Children will adore it, fans of the books will adore it, and even parents forced to listen to their kids read aloud some of the absurd potty jokes in those books will find something to chuckle at here; it is a film that really does have something for everyone to enjoy. Captain Underpants: The First Epic Movie is a hilarious and uncynical family movie that adapts Dav Pilkey’s books pretty much perfectly, nailing the silly and often surreal sense of humour which it embraces wholeheartedly, with everyone from writer Nicholas Stoller to its voice cast including Kevin Hart and Ed Helms having the time of their lives bringing the strange and oddball world of these books to life on the big screen.